A friend of Eric's once commented that our small DVD collection should belong to a seven year old, not two thirty-something professionals. Perhaps he was right in that a few too many Harry Potter movies and Pixar animated flicks fill the shelf. In my defence, most DVDs in my possession were gifts; however, I admit that Finding Nemo and Ratatouille do rank extremely high amongst my list of all-time favourites. 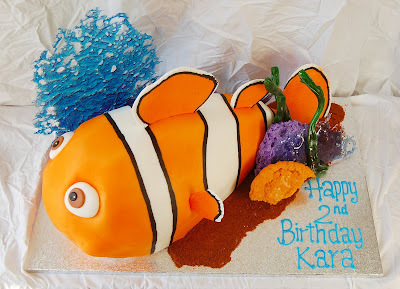 So when the opportunity to make a Nemo cake for a clownfish-loving two year old named Kara came up, it was hard to refuse. 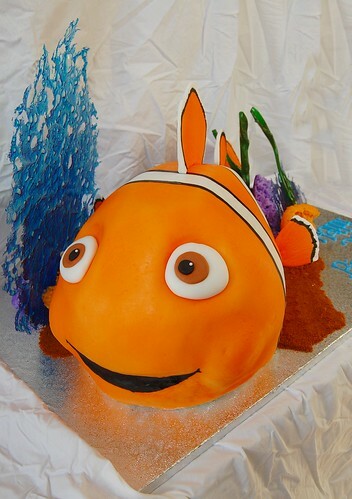 Nemo was covered in rolled fondant and coloured with both airbrushing and hand painting. The purple and gold corals were made of rock sugar while the green sea weed was very rudimentary pulled sugar. I wanted to give an underwater effect by adding a sheet of clear blue bubble sugar. Ultimately, the Nemo cake was so convincing that Kara reportedly tried to hug the cake, confusing it for her Nemo stuffed toy. If that isn't a true compliment, I don't know what is! Happy Birthday Kara!